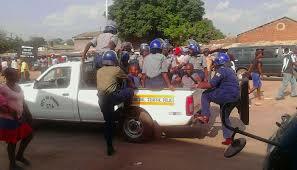 POLICE in Gweru on Monday evening fired teargas to disperse crowds in the city’s central business district after violent clashes with vendors who were resisting confiscation of their wares. The skirmishes, which left scores of people injured in a stampede as onlookers scurried for cover to escape the tear smoke, happened along Robert Mugabe Avenue, near the Kudzanayi long distance bus terminus. When Southern Eye news crew arrived at the scene, an elderly woman was lying motionless amid reports she had collapsed after choking on tear smoke. Members of the public could be seen running along the streets with the combative police milling around the scene armed with rifles. Eyewitness said all hell broke loose when one of the vendors whose wares had been confiscated threw himself in front of a vehicle that was being used by the police officers in the operation and challenged the driver to run over him. “Generally, there seemed to be tension between the vendors and the police. When one vendor threw himself in front of the vehicle that was being used by police in the operation, hordes of people mobbed the cops, demanding answers as to why they were being insensitive. People started whistling and shouting during the commotion. So police fired teargas to disperse the crowds, who were protesting against their actions,” an eyewitness who declined to be named said. Another eyewitness, Job Ngirandi, who is a vendor, said the police’s actions of confiscating vendors’ wares triggered their actions. Vendors last week petitioned Midlands Provincial Affairs minister Larry Mavima to recover their wares they say were valued more than $40 000, which were confiscated by police last week. Gweru Vendors’ Association chairperson Lovemore Reketayi Tingaka told Southern Eye that the latest incident was unfortunate and will be raised when they meet Mavhima on December 4. “I was at my vending stall in the rank when the Monday incident happened. I just saw smoke all over the place and within a short space of time, I saw people running into the rank in huge numbers. We have raised concern over the use of excessive force and the unfair operation by the police with the minister and we will meet him on December 4 as per his request. People whose wares were confiscated last week are yet to get them back,” he said.